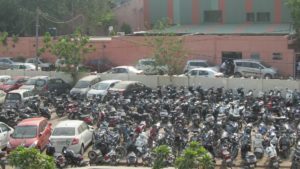 We spent our last week in the southern city of Hyderabad. 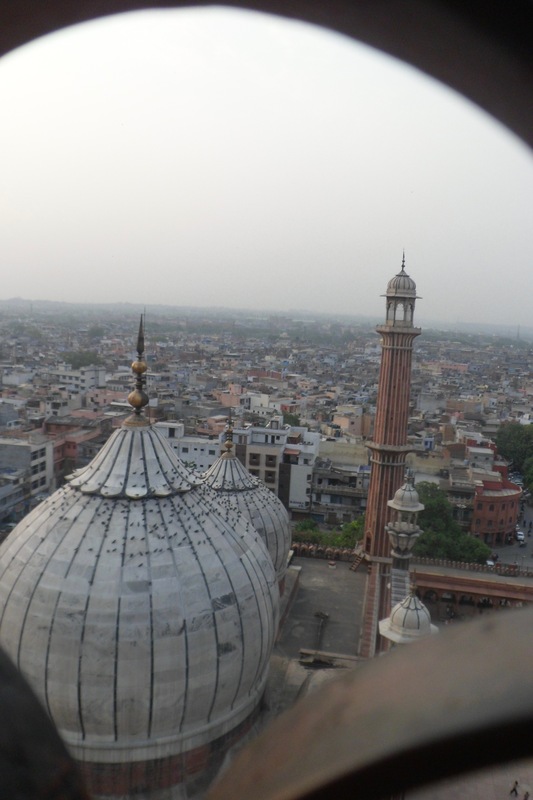 We took a flight there from New Delhi and stayed in the center of the old part of the city. Much of the week was spent in finals, writing papers, doing skits and presentations, and preparing for and taking exams. Nevertheless, we also did get to see some of the city. 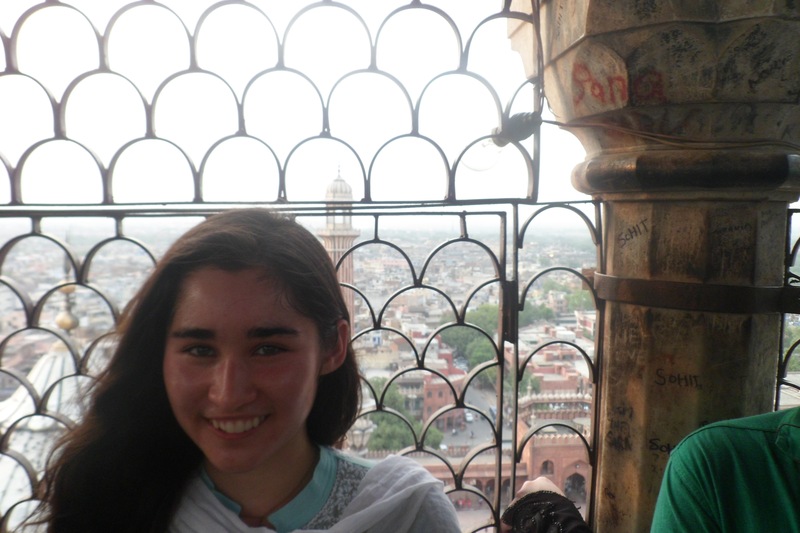 We visited the Char Minar, an ancient Muslim mosque as well as the surrounding marketplace and city center. We also tried biriyani, which people from all over India encouraged us to try every time we mentioned that we’d be visiting Hyderabad. The dish insists of rice and meat, either mutton or chicken, that is cooked with lots of spices and coved in a savory red oil. 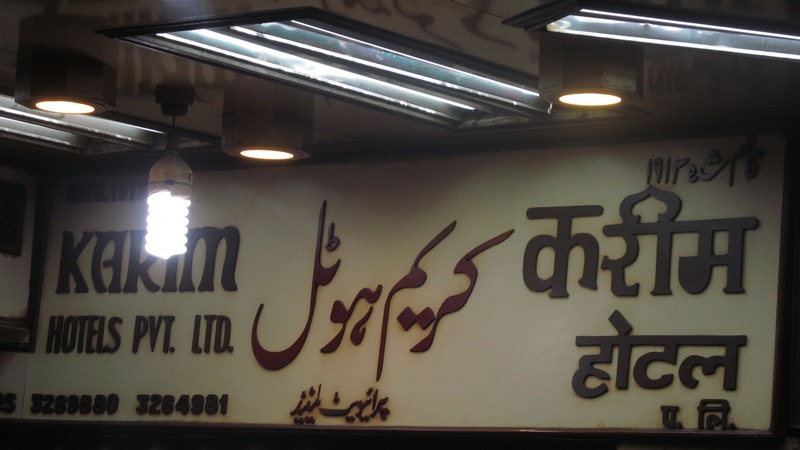 During the week we also visited the Golkanda fort, the Shahi tombs, and the production center of India’s biggest Urdu newspaper where met with it’s owner, Siyasat Zahid Ali Khan. TASK 2: Identify a current and controversial social topic in the newspaper; select something that is perceived as more of a cultural issue than a purely political one. Next, find three native speakers to interview on this topic. Briefly ask them for their opinions on the topic and explore their rationales. Do not inject your own opinion into the interview and remain objective and respectful even if you do not agree with their statements. Consider how cultural assumptions influenced your perception of events/issues and the responses of your interviewees. Religion is a very relevant and controversial social topic we see frequently mentioned in the newspaper. Especially since the partition of Pakistan from India, religious tension between groups in India, particularly Hinduism, Islam, and Sikhism, have divided communities, caused violence, and led to divisive politics. One night in Aligarh, near the entrance of Aligarh Muslim University, we met a Muslim congressman who was out to dinner with his family and discussed how religion is playing into Indian politics. He said that all religions seeks harmony and common good, but that fighting is instigated by politicians who want to use sentiment and religious identity to gain votes and stay in power. He also suggested that government officials are corrupt, and that businesses that supply weaponry and supplies in wars have a monetary gain from pitting religions against each other. This struck me in particular because it sounded like the same as the answer I was told in Bosnia studying the cause of the Yugoslavian war. The Yugoslavian war resulted in ethno-religious slaughter and partition into four countries based on ethnic identity, despite the fact that people of all groups remain in each country. The Aligarh politician’s statement led me to the greater question of how people of different identities live together, and how they are driven apart. 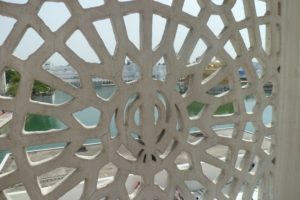 Visiting Mathras, the birthplace of Krishna, I met a man at the temple and asked him about the historic mosque next-door. He firmly encouraged our group to stay away from there, telling us that “they are bad people”. The Char Minar in Hyderabad is a monument and mosque which is a relic leftover from Muslim rule of the city. 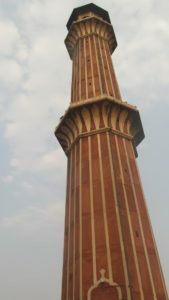 The site has become a subject in newspapers because of the establishment of a temple to Lakshmi, a place of Hindu worship at the base of the Char Minar. 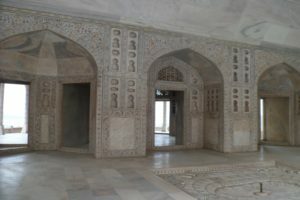 Many consider this a part of a growing trend of Hindu temples being established at Muslim temples and historic sites. I asked a street vendor about this and instead of getting passionate or angry, he said he trusted in Allah to carry out justice, so he wasn’t going to judge whether the Hindu’s were acting in a way that was right or wrong. Islam is a religious minority in India, with Muslims numbering 172 million people or 14.2% of the country’s population. 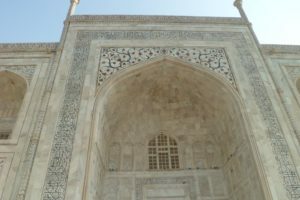 Despite being small in size, Islam has a long history in India and has left a notable mark on the country’s culture in the form of architecture, art, music, and more. Further Muslims carry substantial political power. One of the five pillars of Islam is the hajj or pilgrimage. While the Hajj is carried out year round in Mecca in Saudi Arabia, the 6th-12th days of the 12th month of the Islamic calendar are a special time for preforming the pilgrimage and therefore a significant event in the year for Indian Muslims. The Sikh religion, which was born in 15th century in Punjab and is now split between Pakistan and northern India is founded on religious tolerance. While in Amritsar, a holy site of Sikh worship in Punjab, we saw a painting of the Sikh founder Guru Nanak, which a woman told us depicted him in Mecca seeking to worship with Muslims. Throughout his life, Guru Nanak sought to unite people of different faiths without making them abandon their own religions, and even had a Muslim as his closest friend. Nevertheless, when we brought this up with an official he adamantly denied that the painting depicted Mecca. 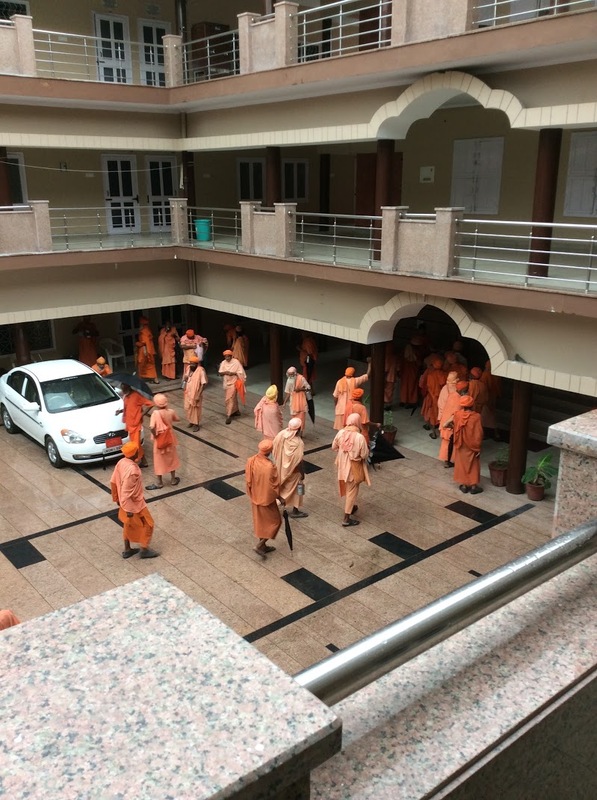 Our professors told us that the woman’s explanation was what officials had told them in previous years, and suggested that the official’s new response was because he had a prejudice against Guru Nanak being associated with Islam. In India, dalits are the lowest caste, and discrimination against them at ever level of Indian society, from villages to top universities, is frequently reported in both Indian and western media. In particular the millennia old practice of “untouchability” or exclusion of dalits from full participation in society has been highlighted as a major human rights issue in India. Coming into this country as foreigners, my group members and I had a lot of questions about this group which comprises up to 32% of the population of the state of Punjab and 21% of UP or Uttar Pradesh. Throughout our trip, as groups and individuals we approached many dalit workers in our hostels, Indian friends, and people who employed dalits as servants. Overall, we found that people of all castes and economic groups were very reluctant to talk about this and were quick to change the subject. Eventually I encountered the Dean of Jamia Millia Islamia University, who, while not being a dalit, had a lot to say about the rights of Dalits in India and how the university is addressing it. He compared the struggle of Dalits in India to that of African-Americans in the US, and criticized the lack of attention to Dalit discrimination in post-colonial India. He explained the quota system (equivalent to affirmative action) which the government of India has established for all universities in India to ensure representation of all social and ethnic groups. In particular JMI is labeled a “minority character university” by the government, meaning that they represent and uphold the culture of the Muslim minority in India. Keeping this minority character in mind, the university is devoted to and known for having a diverse campus, and heavily recruits dalits from low economic backgrounds. TASK 6: Interview three people of different ages and genders with whom you are familiar/friendly about their attitudes towards the United States. What is their attitude towards the US in general? Are there specific issues (e.g. foreign policy, government structure, culture, etc) that they especially like/dislike? What are their rationales for these attitudes and opinions? Do not inject your own opinion into the interview and remain objective and respectful even if you do not agree with their statements. Consider how local cultural values influenced the responses of your interviewees as well as your own (internal) reactions to their commentaries. The first person I talked to was Lali, a Punjabi factory owner in his twenties who had recently gotten engaged. He had a lot to say about the upcoming US election, which I have noticed is being covered thoroughly in media sources throughout India. Lali was quick to denounce Trump and compared him to certain prominent politicians in Indian government right now who use religious power to get elected but who are actually corrupt. In politics in India today, the BJP is the party in power and is often tied to Hindu nationalism. This criticism is especially strong from it’s rival the AAP, or Aam Admi Party, which markets itself as representing the common man. Nevertheless, AAP has also been receiving increased criticism from media for aligning itself with religious leaders. The second person I spoke with was Mr. Uppal, a father living in New Delhi. He sees the western economy as being on the decline, but firmly believes that America’s capitalist structure will keep it as a world power. In India, we have encountered many people with a notable work ethic, from shopkeepers to wealthy businessmen. Speaking from his own experience, Mr. Uppal argued that the work ethic fostered by the capitalist structure which made the US so successful is what is fueling the current rapid growth of India’s economy. The third person I spoke with was a woman named Mrs. Kumar on the train from Punjab to Delhi who works in media and has a son in school in the US. She compared India and the US, noting that India is family oriented and pluralistic while America is more individualistic and isolated. She also mentioned that since going to the US her son has picked up more “western” habits, like calling her less, and she said that this is the mark of globalization. 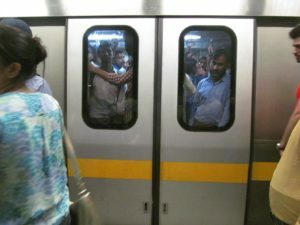 Back in Delhi, we spent the week in class and exploring the city by metro. 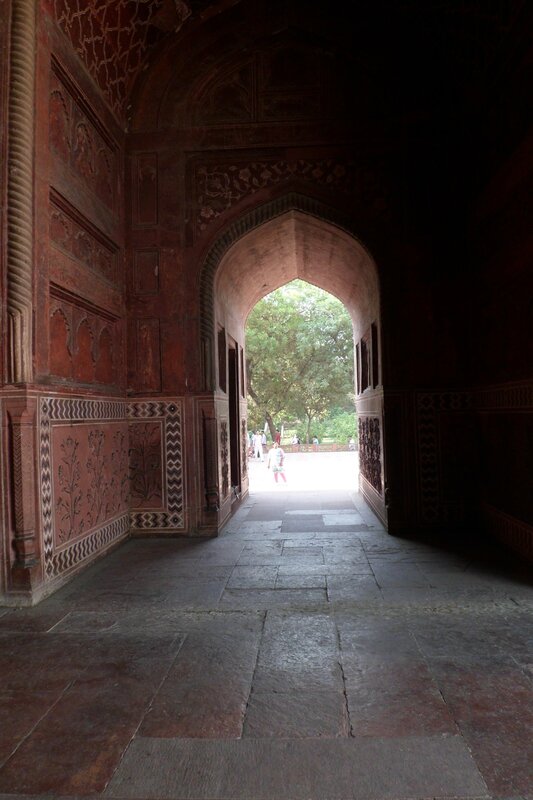 One day we walked to Lodhi garden, a beautiful sprawling public park. We saw dozens upon dozens of young couples and families walking around and picnicking by the creekside, playing on the green grass, and taking pictures by the flowering trees. 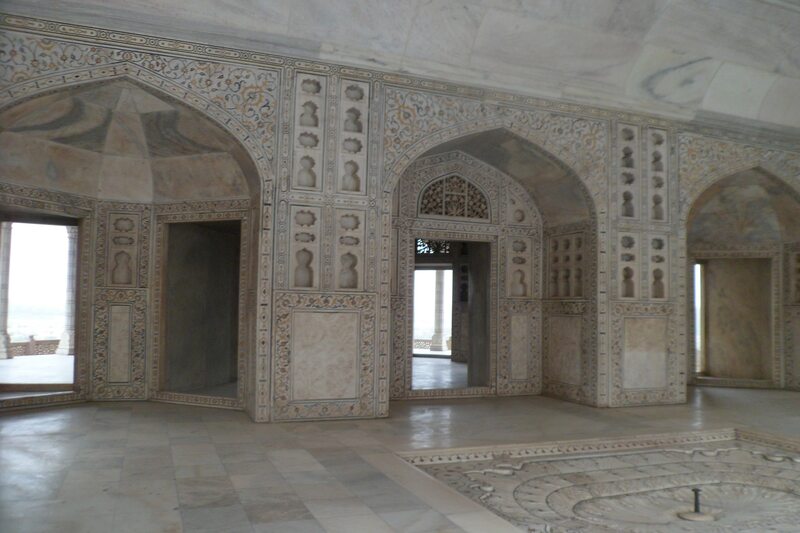 Within the park there were also runes of the Lodhi dynasty and the tombs of it’s rulers. In our hour there, we only saw a small portion of the 90 acre city park. Through the park and down the street we arrived at an arts center with an auditorium where we saw a performance of Odissi dance. Odissi dance originates from eastern India and is one of the oldest surviving traditional forms of dance in India. 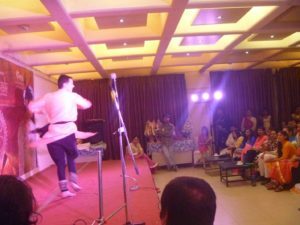 During the performance we got the chance to hear about the arts and cultural preservation fund based in Delhi that supported the performance. Sujata Mohapatra, perhaps the most famous Odissi dancer in India, preformed a passage from the Ramayan, the sacred Hindu text. Her dancing was quick, intricate, expressive. Her hands and eyes moved in a way that was lively and captivating as she told the story of Ram and a giant bird seeking to rescue Ram’s wife Sita from Ram’s enemy Ravana. Perhaps most impressive was how her expressions and body language switched to convey the story of all four characters. Later in the week we visited a family’s home on the outskirts of Delhi. During the week we also went to two well-known markets famous for their handmade work, Dillihat and Janpat, and spoke with local artesans about their work. Another night we went on a mission to see all of Old Delhi. That night we saw the Jama Masjid, tasted Jalebi at a famous street shop, visited a historic Jain temple and bird hospital, and had quorma for dinner at a well known restaurant called Kareem’s. One thing that stood out that night was that the narrow streets came to a standstill for around twenty minutes as an endless stream of carts and rickshaws came by carrying people to the mosque for prayer in celebration of Ramadan. 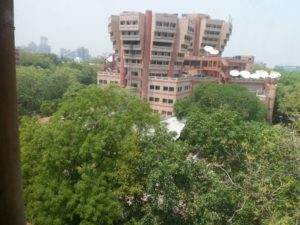 The next day we visited Jamia Millia Islamia University and met with the dean, who gave us the story of the University’s history as well as it’s status as a minority character public school and it’s role as a Muslim university. 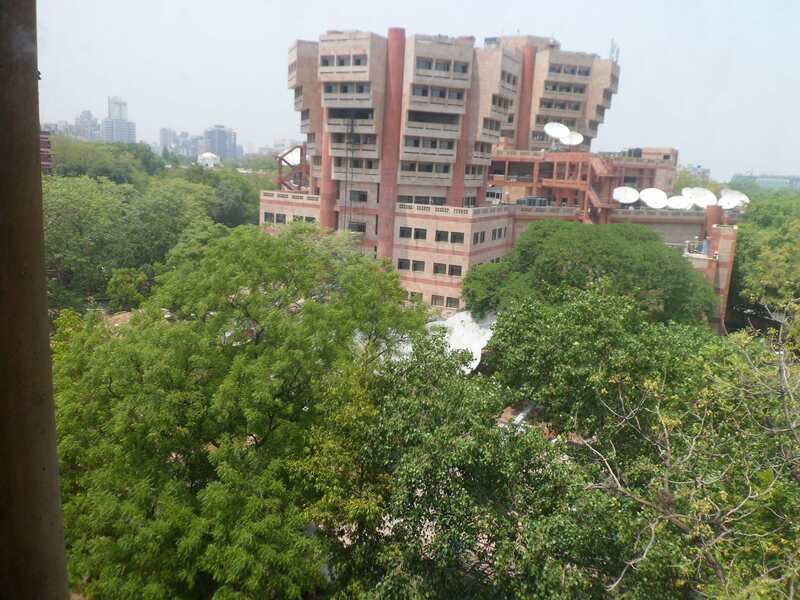 On one of our last days in Delhi we visited the production center for Doordarshan, the state run media group. There we were led on a tour, and got to meet many men and women involved in all levels of production and ask them questions about their work. My biggest language challenge this week was when I was talking with some people in Hindi over chai at a street stand. I was trying to ask someone about his studies in engineering, but struggled with vocabulary and sentence structure. I think the worst part though was that my professor was looking over my shoulder which made me anxious about making a mistake, so my biggest challenge with the language right now is to not shut down under pressure. 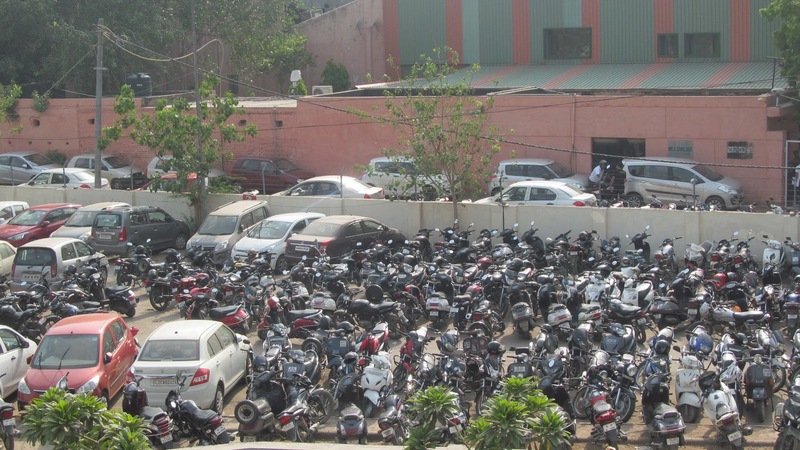 In the fourth week we ended up staying in Ludhiana a few days more than planned. We spent a lot of time with the hotel owner Aajit who was very generous with his time and showed us around the city. 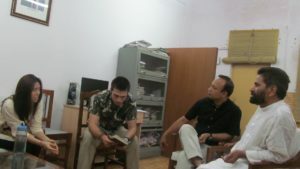 The best place he showed us was Lahore Book Shop, off the main road and down some small side streets. On the outside it is unassuming,yet the shop fulfills every romantic notion that comes to mind when you hear the word “bookstore”. The smell of old paper filled the tiny narrow room full floor to ceiling with books as the owner, Aajit’s friend, led us around showing off his collection of books in Punjabi, Hindi, and English. More of his friends later showed up to meet and talk with us. One day we traveled to a large Punjabi village named Maler Kotla. Maler Kotla is unique in that was not affected by religious violence and exodus like many other villages during partition. We started in home of my professor’s friend where we were introduced to the family’s three daughters and shown around their farm. 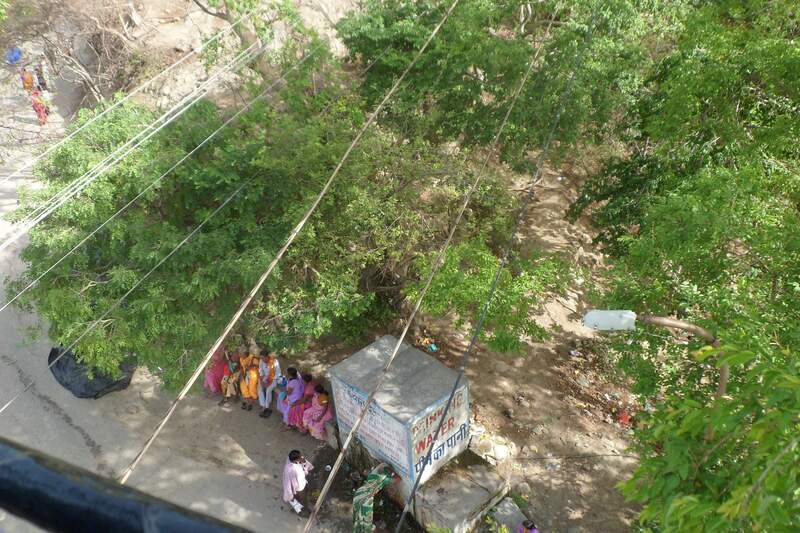 From there we road in a tractor along with about of a dozen children from the village to see a wrestling match. Afterwards we went to the local mosque but first stopped to eat samosas with honey in a shop owned by friends of the family we were visiting. We ended up stopping at many houses of locals who urged us to come in and drink chai. At the end of the night a few dozen children from the village came to catch a look at the foreigners and to wave us goodbye. On our last day in Ludhiana, we visited Raja Ranjit Singh’s fort. Two friends of Aajit joined us and we walked around and for an hour. As we toured the fort I walked with and spoke in Hindi with a woman named Sarab. 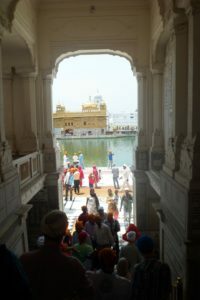 At the end of our stay in Ludhiana, we took a bus to Amritsar, a city famous for Sikh pilgrimage. In Amritsar we visited Sri Harmandir Sahib, the holiest Gurdwara in Sikhism commonly referred to as “the Golden Temple” by foreigners. 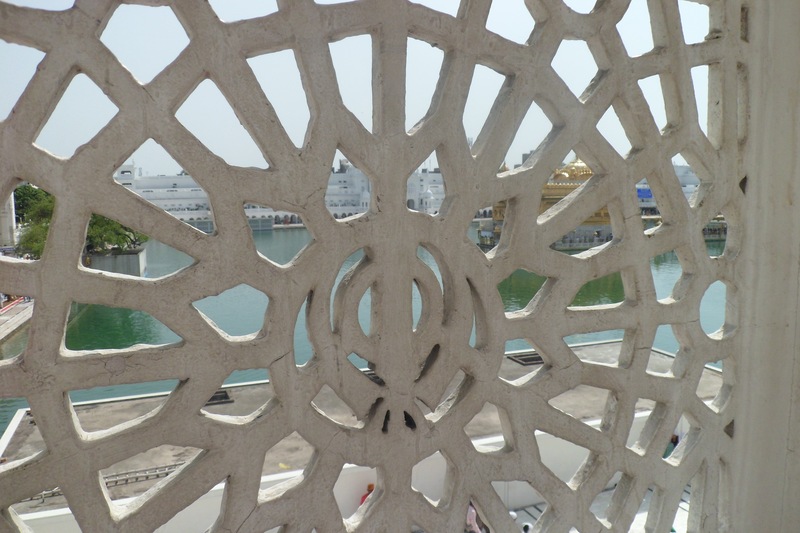 There, among thousands of pilgrims in prayer and worship we experienced the centuries old architecture of the Sri Harmandir Sahib, ate at Langar or the community kitchen, and walked through a museum dedicated to Sikh history. The next day we visited the Wagah border. 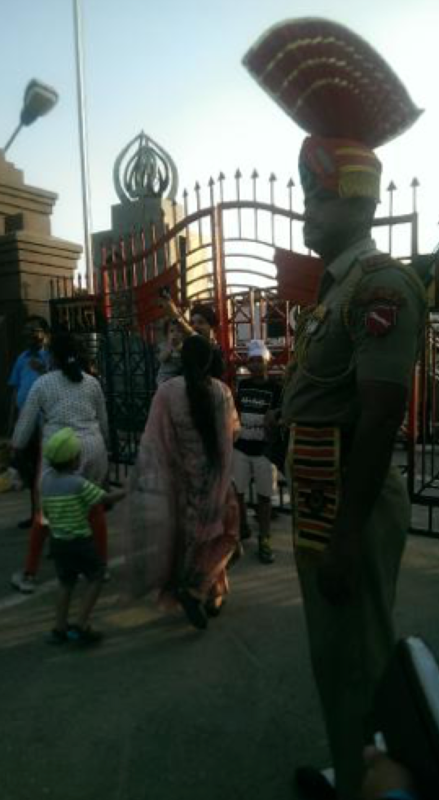 Here the boarders between Pakistan and India are separated by gates which are raised in synchrony in an elaborate ceremony. With over an hour to go before the performance began, the stands were packed with families, groups of rowdy young men, and foreign tourists. 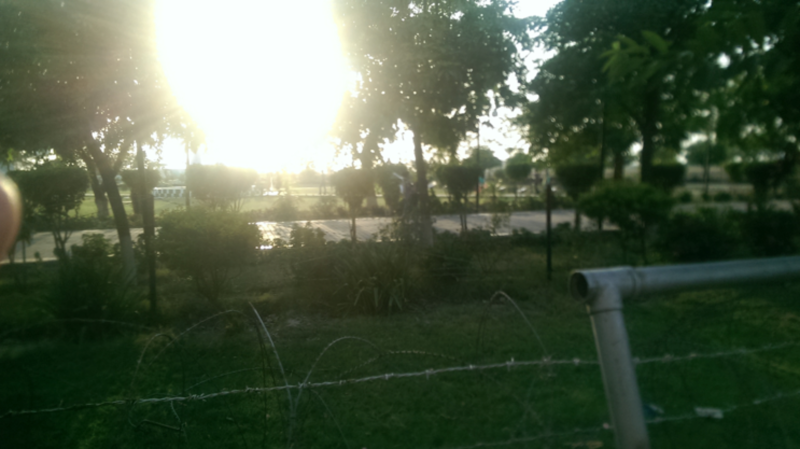 Even the sweltering heat of the sun beating down didn’t reduce the energy of the scene. 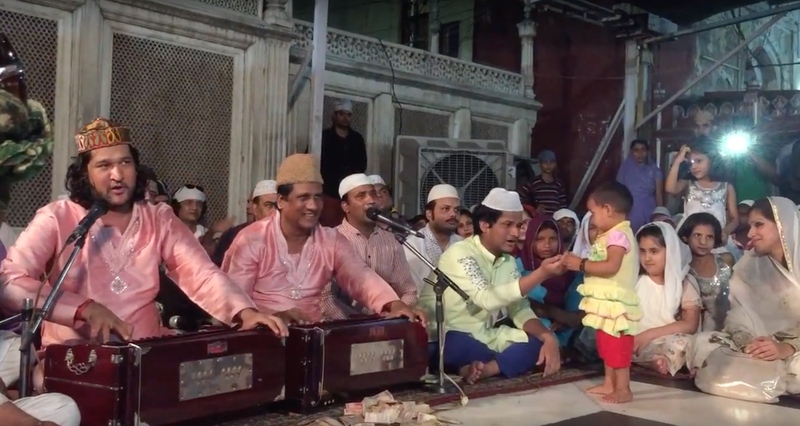 Music about the love and pride of Hindustan blasted over the murmer of the wide eyed crowds chanting with proud smiles and fists pumping in the air. The soldiers towered over the average citizen as they powered towards the other side with wild eyes and violently high kicks to puff their chests and flex their arms at the other side. 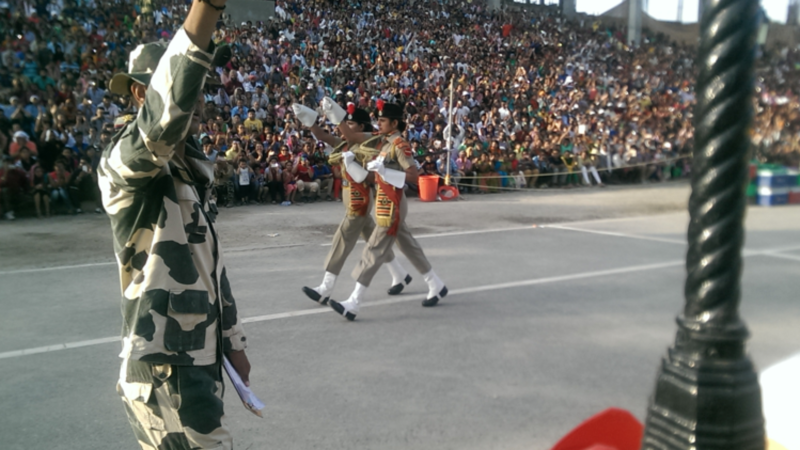 All the while, citizens cheered and lifted their cameras to film, “chanting long live India!” to the encouragement of one another and the MC. The next day, we returned to Ludhiana to spend a few more days focused on our studies to compensate for future travel. During this time we watched a movie Bol about women’s rights in Pakistan. Most of the days we spent in Ludhiana the other intermediate Hiindi students and I went out with our professor and spent the afternoons running errands. At first he did most of the talking but he quickly turned it over to us, having us lead discussions with locals on money exchange, transportation, and food. This more often than not led to us being invited into people’s shops, where we sat down for long conversations over chai. 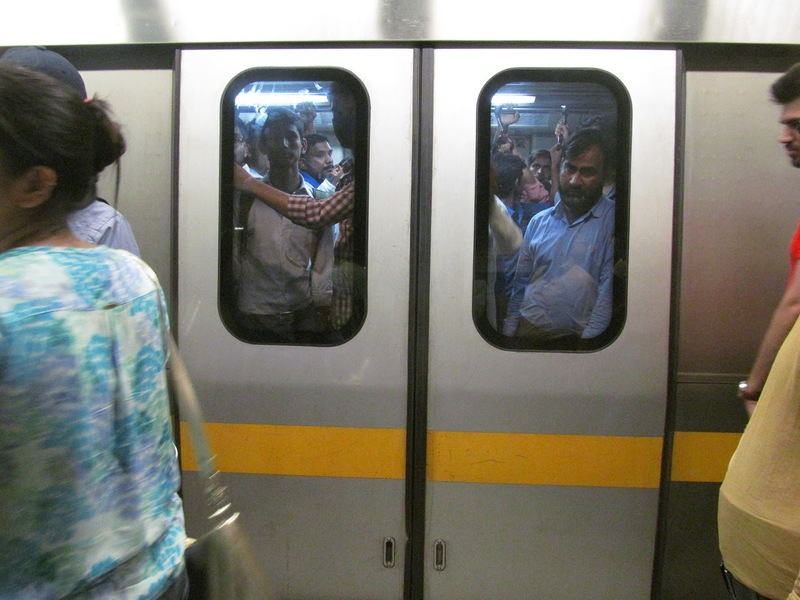 We ended the week with a return to Delhi on the famous nation-wide train system. Despite it being our last day in Haridwar, we woke up bright and early at 5am to visit a temple on the mountainside before our bus came at 10am. Meeting up with our professor’s old friend, a Hindu priest, we weaved our way through narrow uphill city streets up until we got to a ticket stand, which didn’t actually open for another half hour. Over time a crowd began to form in the small intersection of streets where the ticket. Motorcycles honked and forced their way through the crowd of people congested in the center and weaving back up the hilly streets. 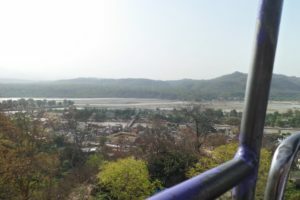 Eventually when we got our ticked, we took an aerial tram up the mountainside, getting a view over the whole city, mountainside, and Ganga below. When we arrived to the top of the mountain and entered the heart of the temple, the crowd was so large that you were squished against people from every side, everyone pushing their way through the slow moving current of people to pay respect to the goddess Mansa Devi. As soon as we got out of the temple, we rushed back down the mountain and took a rickshaw back to our ashram, where we packed our bags together and jumped on our bus to Punjab. On the way we stopped in Saharanpur, a city in UP famous for woodwork and a variety of other textiles. There we had lunch with a successful language teacher who is contracted to teach Hindi at UNC-CH this coming year. We then visited some local family-owned businesses, where the workers and owners explained all of the steps in constructing their wood textiles which are shipped all across India and the world. 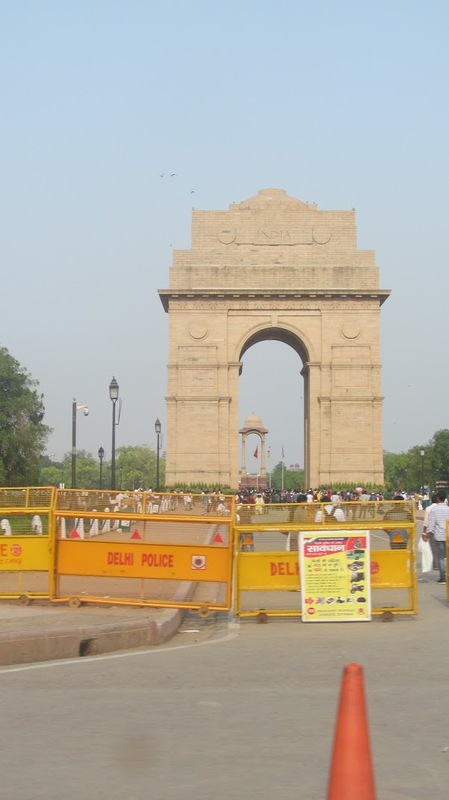 The city was also getting ready for a visit from Prime Minister Modi which coming up in a few days. Getting back on the bus, we continued traveling on the Punjab, reaching our hotel in Ludhiana late at night. To make up for all of our travel, the next few days were spent fairly intensively in class and writing papers. 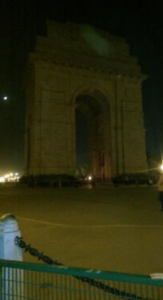 we took some time to explore the city at night and to go see the movie Sarabjit, a film in Hindi about political animosity between India and Pakistan after partition. 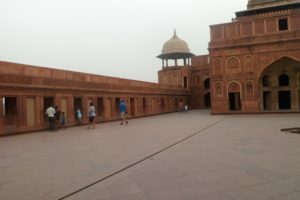 On our eight day we drove from New Delhi to Agra. In Agra, we continued daily class as usual in addition to seeing much of the city. On one of our first nights in Agra we were invited to an engagement ceremony that took place in our hotel. 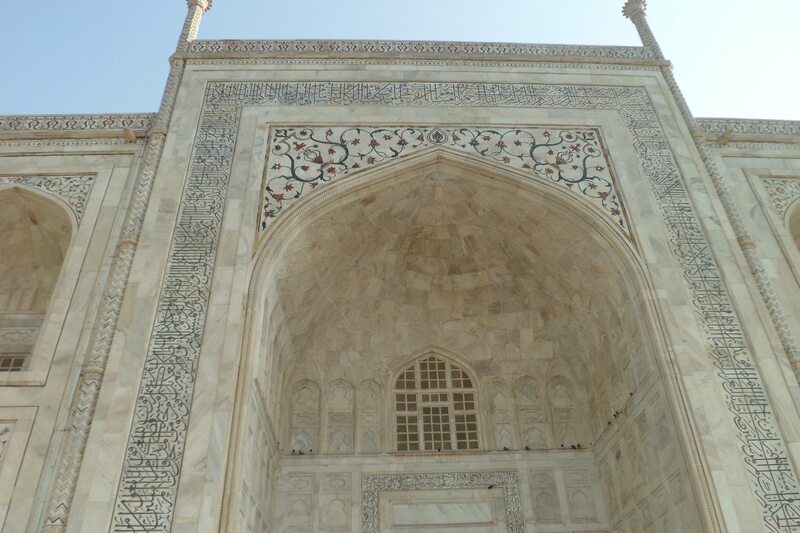 We also visited famous sites such as the Taj Mahal (first 3 photos) and the Red Fort (last 2 photos) in our free time. 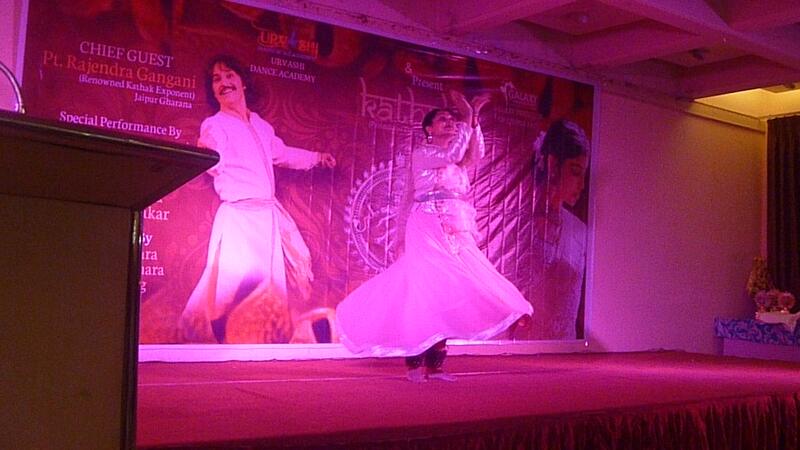 Another night, we witnessed Kathak dance, which is derived from Bharatnatyan dance in the south. Afterwards, over refreshments we spoke with many of the families of the performers who had come to watch and I was able to practice my Hindi. 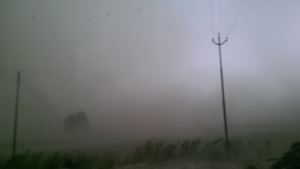 From Agra we drove to Aligarh. On the way we stopped at Mathura, the birthplace of Krishna. In Mathura we tried samosas and a sweet the town is famous for called peda. 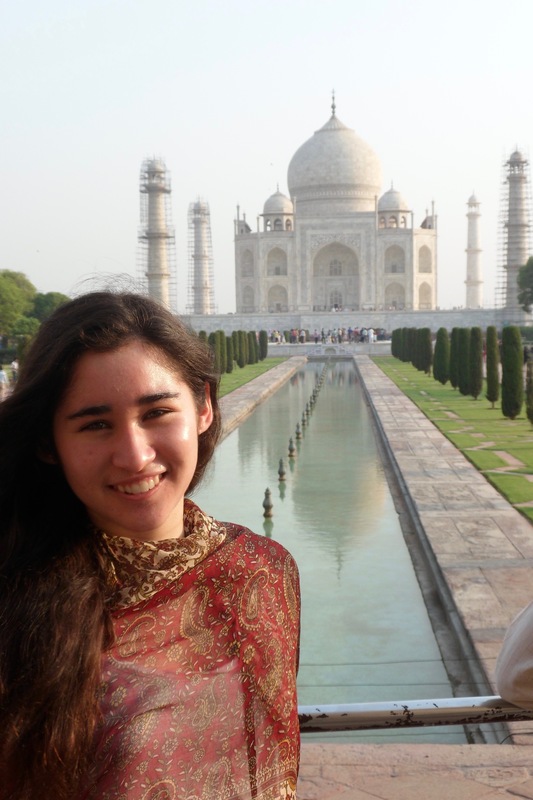 We then went to the temple where the idol of Krishna is held which is a popular site for religious pilgrimage. Later, in Aligarh, we stopped to have lunch with Professor Taj’s sister Shaheda. Shaheda is a mother and also a community activist for the rights of rural people, and works with the government to get them jobs in infrastructure. She said that she often has to fight with the mafia in local villages who try to take the money for themselves. 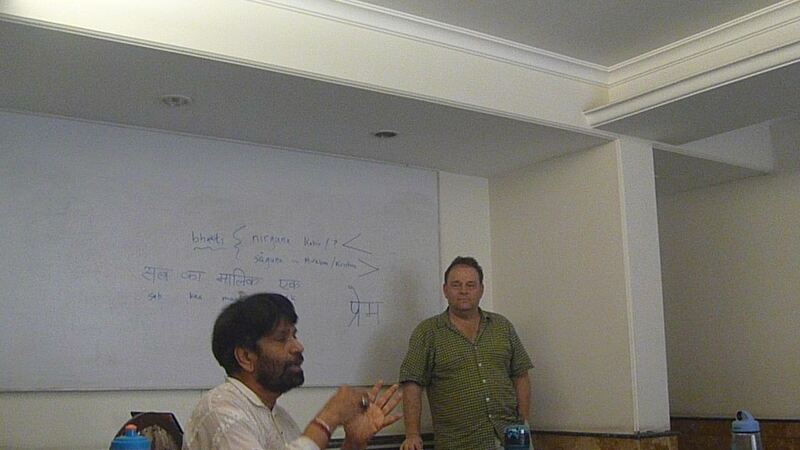 Speaking about more complex topics like politics and community activism in Hindi was more of a challenge for me. I was able to ask her questions when we looked over pictures of her speaking and working in rural communities. I also got the chance to speak with her housemaid when she showed us how to cook roti. 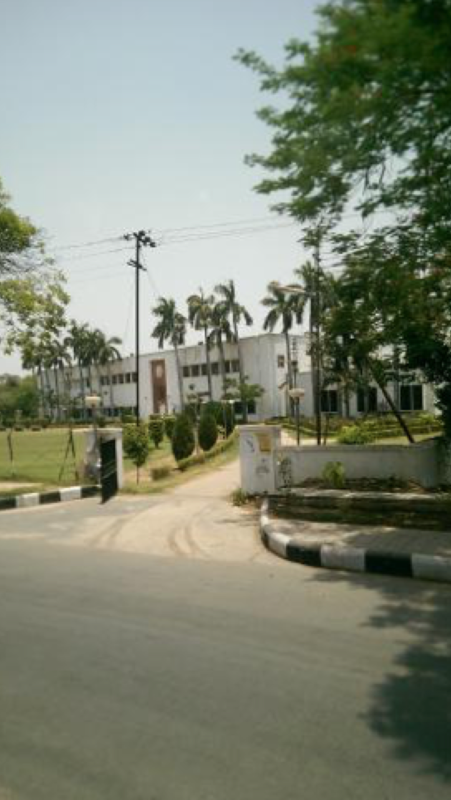 Later that day we toured Aligarh Muslim University, where Professor Taj went to college. On the thirteenth day we drove to Haridwar, an ancient holy city known for Hindu pilgrimage. On the way we spontaneously stopped at a mango orchard where we met a very humble and successful family of Muslim farmers who told us about their business. We ended the day at our ashram, a huge complex that provides food and housing at a low cost for religious pilgrims and travelers. 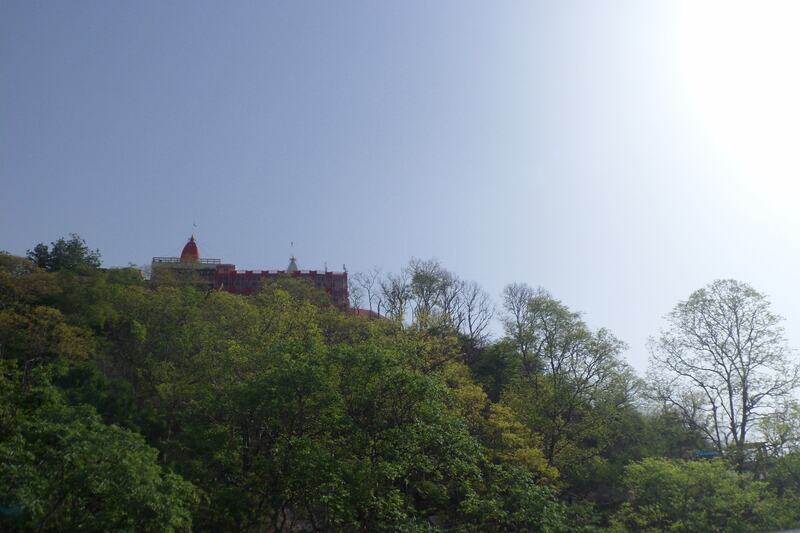 The next day we drove to Rishikesh, a beautiful town nested in the mountains. 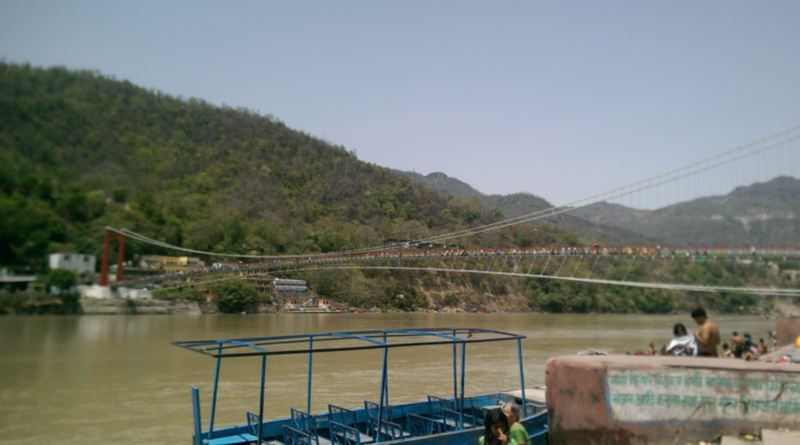 It is famous for it’s narrow teetering bridge congested with people, motorcycles, and cows, it’s access to the Ganga for Hindu pilgrims, and for the hippies left over from the 70s. There we walked along the cobbled riverside street in groups on a scavenger hunt, using our Hindi skills in stores, ashrams, restaurants and temples to check off the items on our lists. 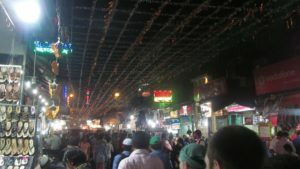 At night back in Haridwar we went to Har Ki Pauri. 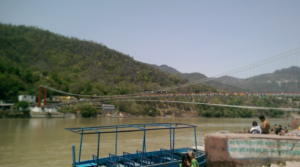 In Hinduism, the Ganga is the personification of the goddess it takes it’s name from. People go to bathe in the water to be cleansed of their sins and to attain eternal life. At the Ganga Aarti ceremony, we sat with tens of thousands of people on the riverbank gathered in prayer, chanting, and clapping in worship of the river. Afterwards, we met and conversed in Hindi with four women and their husbands who were all friends that lived in Haridwar. After meeting up with the rest of my study abroad group in Dubai we flew into Indira Ghandi Airport. When we emerged from the debarring bridge the next morning it was still dark outside, the lights were dim, and Hindi music was blaring. As we walked down the hall to customs the people were sparse, but once we approached the escalator we could see an overwhelming sea of people below. The flow of bodies carried us outside, where we were engulfed by hot muggy air, solicitors, and fellow travelers. Securing our luggage, we got on a bus to Punjab Bhavan. This week we are guests of the state of Punjab, so we are staying in their representative’s compound on a row of state embassies, in a hostel owned by a delegate. By the time we got here it was 4am and the building was having a power outage, so we had to wait for the elevators to come on so we could get our bags up to the seventh floor. Since we had class in the morning, my two roommates and I spent the night unpacking, showering, talking and setting up our water pumps to filter the local water for drinking and brushing our teeth. At 8am we had a breakfast of chai, roti, lentils, and yogurt with a potato curry. The process of moving in at 4am didn’t give me the best opportunity for practicing Hindi with the staff, so going over the class syllabi gave me a good opportunity to practice with my professors. 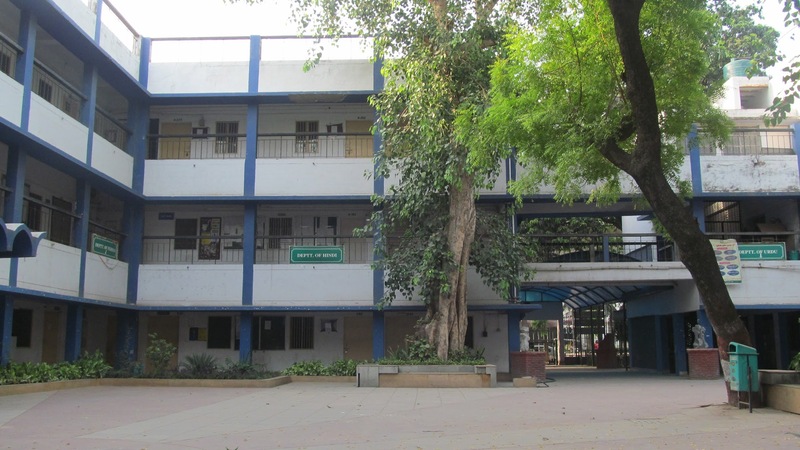 Among the group, two other students also have a year of Hindi study, and the rest are beginners. After breakfast we met with the commissioner delegate for the state of Punjab to New Delhi and he discussed his role as a public servant and his experience with the cultures of various other states. Later we went to a bookstore at the national literature conservatory across the street. 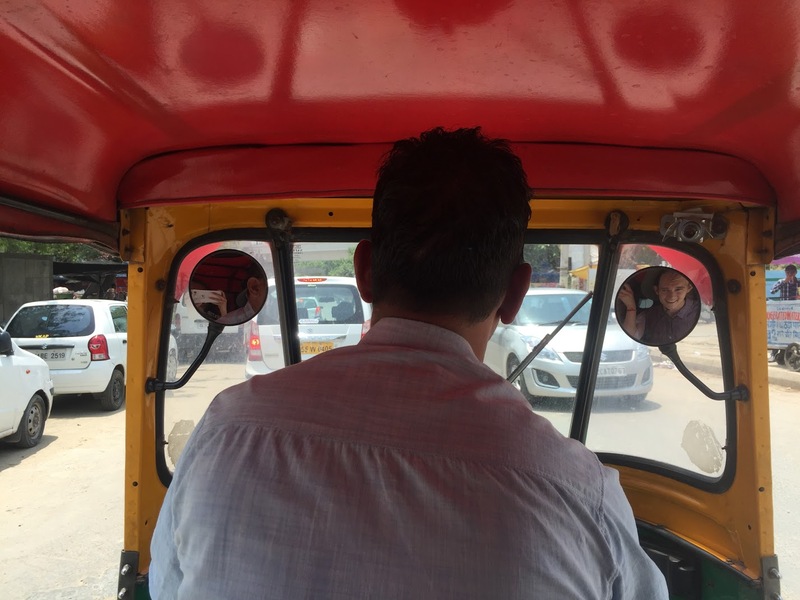 The streets are wide and cars and rickshaws zip past constantly honking their horns. Since most streets lack crosswalks signs, the norm is to wade through the moving traffic. On the second day I had slept off my jet lag. In class I gave an hour long presentation on the Sufi poet Khusrow and his role in forming the Indian Muslim identity. In our journalism class, I teamed up with other students in the intermediate Hindi group to read a Hindi newspaper and present a summary to the class. 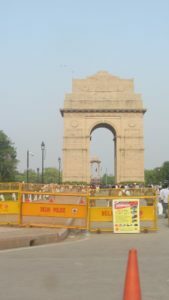 At night we went out to the street fair and saw dozens of food trucks and families playing by the India gate, a gift from the British to commemorate the Indian soldiers who died in WWI. On the third day we had our safety orientation, as well as four hours of class where we discussed the intersection of various religious identities in Indian culture and practiced our Hindi. 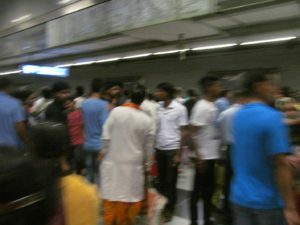 Since the heat gets to 110F by midday, we have to go out at night, so at 6 we took the metro with the girls riding in the women’s section. We went to a downtown area called the Canap Place where we exchanged money, saw British-built colonial architecture, and experienced some haggling at an underground market called Palika Bazar. On the fourth day we woke up at 5am to go to an alternative medicine hospital in the countryside outside Delhi. 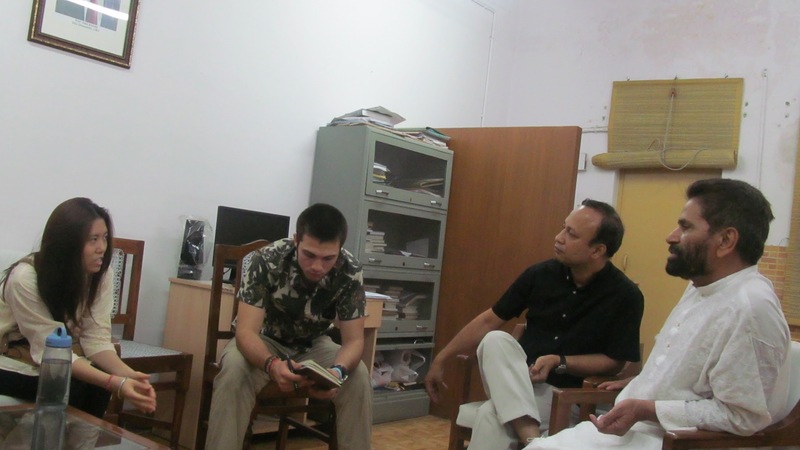 There we were given a tour and talked in Hinglish with the doctors and one of their sons. Since the fifth day was Sunday, my classmate Moreen and I wanted to go to church, so the two of us took a rickshaw to the Catholic church and attended a service in Hindi. Afterwards we took a rickshaw to the metro to Palika Bazaar, where we looked around for a little bit before returning to the hostel for lunch. 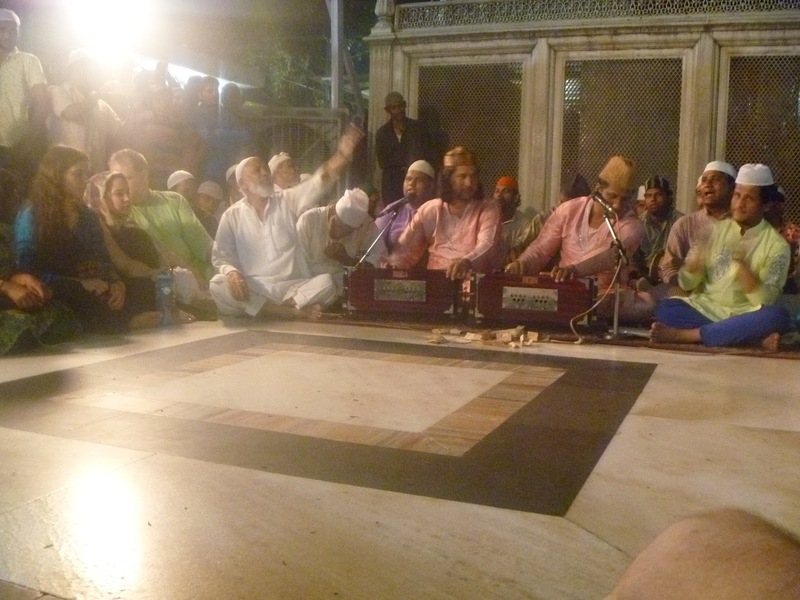 At night we visited the narrow streets of a neighborhoodod known for Muslim pilgrimage in Delhi and witnessed Qawalli worship and the tombs of sufi saints at the Nizammuddin Sufi shrine. We witnessed lots of beggars and people staying at the shrine overnight on pilgrimage. On the sixth day in our classes we discussed the concept of darsham in Hindu worship and the media bias present in television news. During the day we traveled to an ancient minaret called the Qutb Minar, and then a Hindu idol complex called Chattehpur temple. We spent the night writing papers. On our seventh day here we had class. I gave a presentation in which I introduced the Hindu saint Mirabai and presented an analysis of some of her poems. Later that day, we visited the Indian Parliament where we were given a tour of the building, an explanation of it’s history, and an in-depth explanation of how India’s system of democracy works. Cliché enough, Paris is a dream realized for numerous people, of which I have never been an exception. When I read this famous quote from Hemingway for the first time, as a child I imagined nothing but the scents of Paris. Taking his words literally, I envisioned the city to be exceptionally delicious. Would it smell like the most tender and juicy goose liver? Freshly made chocolate whose lovely scent lingers on in the last bit of warm vapor? Or the charming scents of fruits that rise from bubbling champagne? Later on the city has taken on a much more romantic tone, which I imagined to smell like the richest blooming red roses. Then finally at the age of eleven, I came to the real Paris for the first time. Stepping off the coach and rubbering my shoulders with others’, I ran into a Paris filled with crowds and traffic. I understand neither the flowing French around me nor the extremely convoluted layout of roads. The intensive package tour exhausted both my parents and I, struggling to force our sore feet on and to memorize the numerous monuments we saw. The dreamlike city vanished in the face of fatigue. My host family is in a tranquil neighborhood in the second arrondissement, minutes away from le Centre Pompidou and the Seine. Opening the door, a cute black cat greeted me with clear elegance and suppressed curiosity. A lovely start of my Parisian life, I thought. Pondering the limited amount of French that still remains in my memory after a month of summer vacation, I stammered to my host mother, “Bon..bonsoir ?” She gave out an encouraging smile, though the next minute her cheerfully flowing French quenched my growing pomposity. As I finally lay down on my bed, looking at the darkening sky outside, my Parisian life started! Since the program at la Cours de Civilisation Française de la Sorbonne (CCFS) do not begin until July 4th, I have the leisure to roam around Paris for almost a week. I started to immerse myself into the francophone atmosphere all around. There were times when I successfully “became” as a local, while other times I sneaked back into the familiar American space at Starbucks. 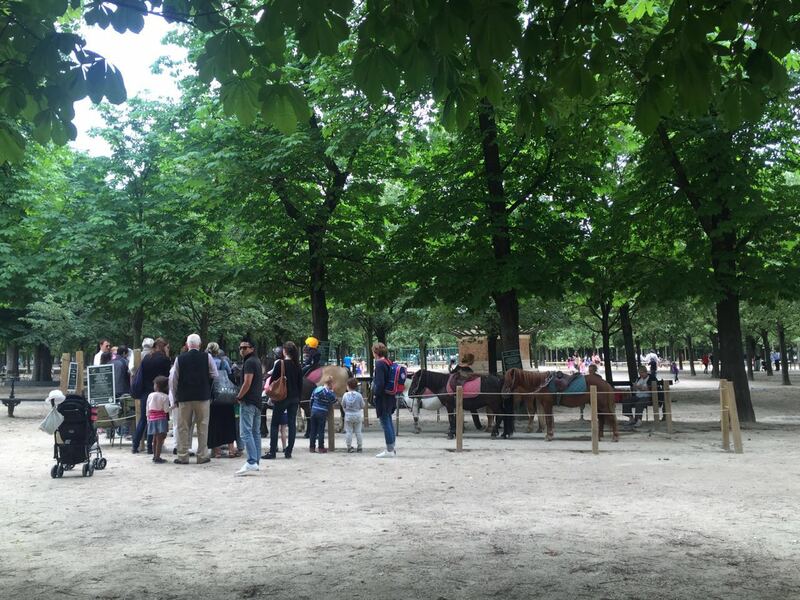 Yet as I sat on the bench in Jardin du Luxembourg, amid numerous French people, I began to feel the everyday Parisian life creeping upon me. This time, and for the first time, I am not a hasty passer-by who would no doubt missed much beauty of Paris. I would not turn off my ears to the melodious French as a lazy traveler. La vie est belle. Encore plus belle quand elle se passe doucement. Upon arriving in Beijing, I immediately realized I had a bit of ways to go in terms of language progress. Asking people for directions at the airport and on campus, I never completely understood what anyone said. As far as adjusting to the life at Peking University, there wasn’t anything too difficult. Class is a little overwhelming, not necessarily because of the difficulty of the course (though it’s not easy) as much as the sheer amount of time it takes in the day. I do wish there was a little more time to go exploring, but I’m sure I’ll be able to better manage my time for this in the future. The food situation is interesting. There are many things that we’ve been warned against, such as cold dishes, fruit, and food carts on the side of the street. The dining halls and restaurants on campus are very reasonably priced, it’d be hard to eat more than . A lot of the other students complain about the food but I actually like it hahaha. Once late at night everything was closed and I was pretty hungry so I bought something from a kind of dicey looking place. I wasn’t really sure what I was eating, but I survived! The wifi is a little tricky and you have to use a vpn for some sites, but so far everything’s gone pretty smoothly, and still excited to be here. Between classes and living in with a French family, I really feel like I’ve learned a lot over the past four weeks. Beyond the progress I’ve made in my my French, however, I also feel like the fact of being in an international environment has been a huge education. There are students from all over the world at l’Institut, so I’ve had the opportunity to get to know people from different cultural backgrounds in a way that I’ve never before experienced. Obviously Notre Dame has its fair share of foreign students, but that doesn’t quite compare with the student body here in Tours. And although there have been several large contingents from American universities recently, I’ve actually had relatively few Americans in my classes. Two of my closest friends in Tours are from Chile and Liechtenstein, respectively. It’s been so interesting to talk to them and learn what their countries are like. Coming from a country where you can drive for hours and still be in the same state, it has been fascinating to hear about one where it’s a 30 minute drive from north to south. And when I mentioned that I missed seeing mountains, my friend Paola told me that there are always mountains visible in Chile, no matter where you are. I’ve learned so much about French culture since I’ve arrived, but through class discussions, presentations, and conversations outside of class, I’ve also learned a lot about other places and cultures. Having never travelled to Europe before, this trip definitely put me outside of my comfort zone, but that’s exactly what I needed in order to encounter the new and unfamiliar. My adventure in Tours is almost coming to an end, so I’m trying to savor whatever exciting new experiences come my way this week. A la prochaine! 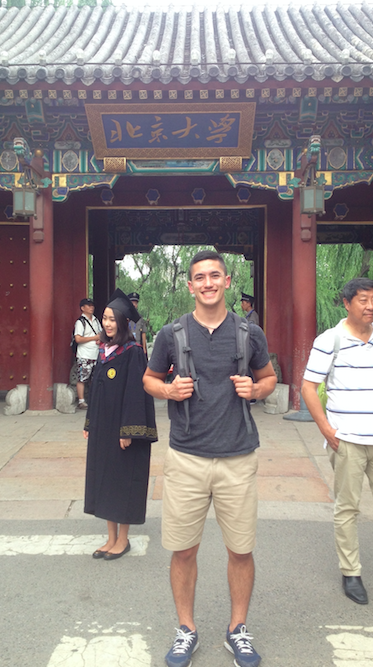 Last Friday, I arrived in Beijing to begin my Summer Language program for Notre Dame. The program is dedicated to the immersion of students into the Chinese culture and language, and that immersion is swift to say the least. As soon as I got off my flight, I exchanged my USD for some Renmenbi, and hopped on a van to Peking University to begin my experience. Driving into Beijing, I was first struck by the traffic. I knew Beijing is one of the world’s largest cities, yet the sheer immensity of the population struck me. Arriving at Peking University （北大as it is known here), I settled in and got ready to begin classes. Monday marked the beginning of the program, and meant my full commitment to immersion into Chinese culture and language. Before class began, I signed a language pledge, promising to only speak Chinese for the next two months. My classes run from 8am-12, followed by a 40 minute individual session and culminating in study hours in the evening. This is accompanied by 3-4 hours of preparation every day for class and our daily quiz (小考）. In third year Chinese, we are beginning to study more interesting topics then just the basic communications of how to giver directions or order food. In our first week we considered what traits are desirable in a role model, and discussed the implications of “freedom” in different countries. It is fascinating to hold discussions in Chinese the same way as I would in English. I am really excited to continue exploring relevant political, social, and cultural topics, so that I will be able to fluently discuss current and historical events. While class at Peking University is exciting and challenging, the true immersion is during our “free time.” Everything from a trip to the convenience store to visiting the Great Wall requires students to push themselves. I am consistently out of my comfort zone when I walk around Beijing, yet I know that every time I hold I bargain at the Pearl Market or ask for directions to a restaurant, I am learning. Last weekend, our program went to visit the Great Wall. The climb was steep; at some points you had to use hands to pull yourself to the next stair. Yet at the top, the exertion was worth it. The view from the Wall was awe-inspiring, and painted a much different picture then the bustling urban hub of Beijing. For miles around, mountains and trees and lakes painted a scenic landscape. It was inconceivable that a city with 12 million people was just an hour away. This weekend, we are planning a trip to the Forbidden City. These weekend excursions are a great break from the classroom, and are also a very effective way to practice our language skills with native speakers. While it is often a humbling experience to converse with people in Beijing, everyone has been very patient and encouraging, and every conversation is more fluid than the last. Learning Chinese in Beijing requires dedication. Everyday is a struggle to understand and to communicate, yet everyday I can feel my proficiency increasing. It is a remarkable experience to be able to recognize my improvement day to day, and I am excited for what the next six weeks bring me.